CAELAN: How many is Pop? SARAH: How old is he? Um, let me think…He’s 71. CAELAN: Okay then he gets a sticker cause he’s 21. CAELAN: 71? He gets a sticker. CAELAN: I have a boo boo. SARAH: That’s not a boo boo, that’s a freckle! CAELAN: I have a freckle?! Who put a freckle there?! CAELAN: [hands me a plastic egg] Don’t open it, Mommy. The Grinch is in there. SARAH: The Grinch?! You’re mixing holidays, but okay. CAELAN: [singing] The Grinch is in there, the Grinch is in there! SARAH: Don’t jump on me, Caelan. You can sit on me, but no more jumping. CAELAN: Yes I can jump, Mommy. It’s my job. CAELAN: I see a elephant!! NO, I SEE A CHEETAH!! CAELAN: [singing to the tune of The Wheels on the Bus] Can I have more milk, can I have more milk, all through the town! SARAH: What do you say? CAELAN: Please, all through the town! Caelan wants to sit on my back. CAELAN: How’ bout…10 more times? CAELAN: DON’T FALL OFF THE TRACK!!! YOU HEAR ME, PERCY?! Then Thomas did the same thing and got put in timeout. Got off to a picky start, but now loves anything! Up until about a week ago, Leah was still taking 6 bottles a day. 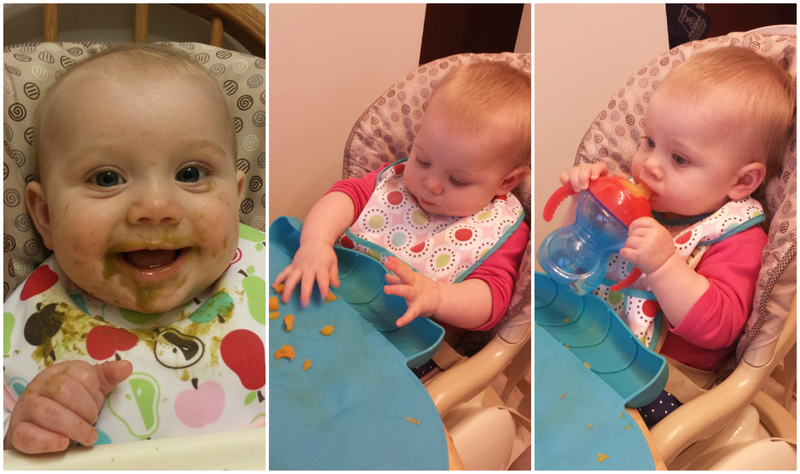 I wanted to start cutting her bottles and beefing up her meals, but I wasn’t sure how to make the transition. Then, as it usually has been with both of my kids, she made the transition on her own 🙂 She’s still erratic, but now she’s taking 4 or 5 bottles a day and she’s not getting one at dinner time anymore. 3 more months till we can start phasing out formula for-ev-errrr!! Sleep training. Just after Leah was 6 months old, we decided it was time. We had been putting Leah down for bed when she was already asleep. It worked out fine except that rocking her to sleep was sometimes difficult and we knew that it was important for her to learn how to fall asleep in the crib on her own. She was also waking up in the middle of the night, anywhere from 1 to 5 times and that had to stop! She wasn’t hungry or wet or anything, she just couldn’t fall back asleep again. 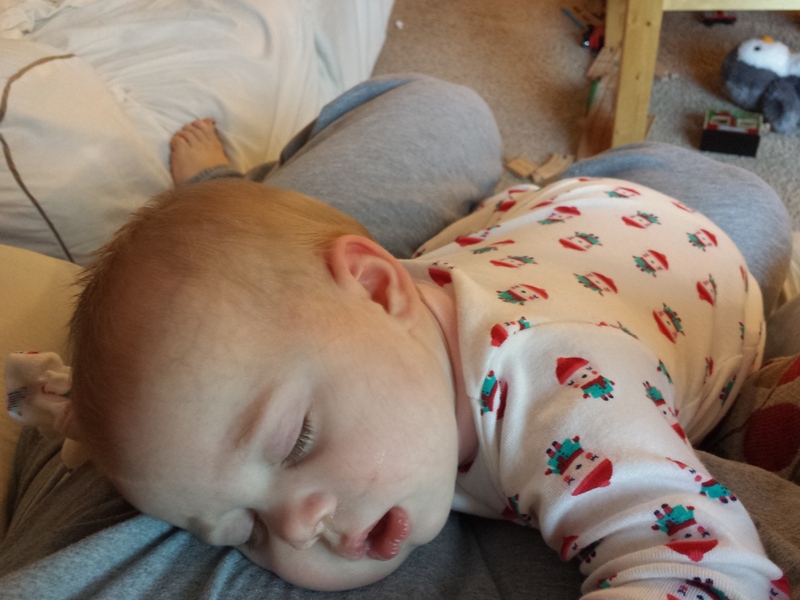 As soon as we’d go into her room and pat her back, she was out again. We used the Ferber method again since we had had such good luck with that with Caelan. Leah cried for 20 minutes on the first night. The next 2 nights it was 2-5 mins of crying and by the 4th night, she was going down without a peep. When we trained Caelan, he continued to cry for 2 mins or so for about a month. But Leah’s issue was never really the initial going to sleep, it was the wake ups. She would still wake up at night and cry but only for a minute or two and she was back out. We’ve had a few minor setbacks due to illness or teething, but we managed to get back on track after a couple of days. Just recently, we realized that most of the time Leah falls asleep drinking her bedtime bottle so while we intended to put her down awake, she’s already asleep. This has a caused a few blips in the sleep training process, but we’re making more of an effort to make sure she goes down awake. Crib full of toys and still not happy! 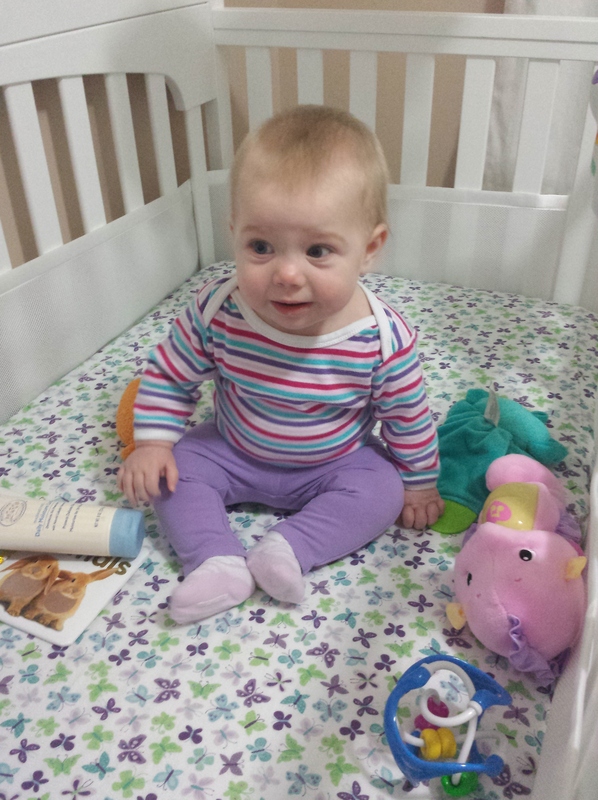 But once Leah and I are both ready for the day, we go into Caelan’s room to get him up. Oh she LOVES Caelan!! He must be her favorite person in the world (with Daddy a close 2nd). She squirms and kicks and grins as soon as she sees him and he is equally excited to see her. So happy to see each other in the morning! Leah is a roller. Caelan never really did this so despite Leah being our 2nd, it was new to us. 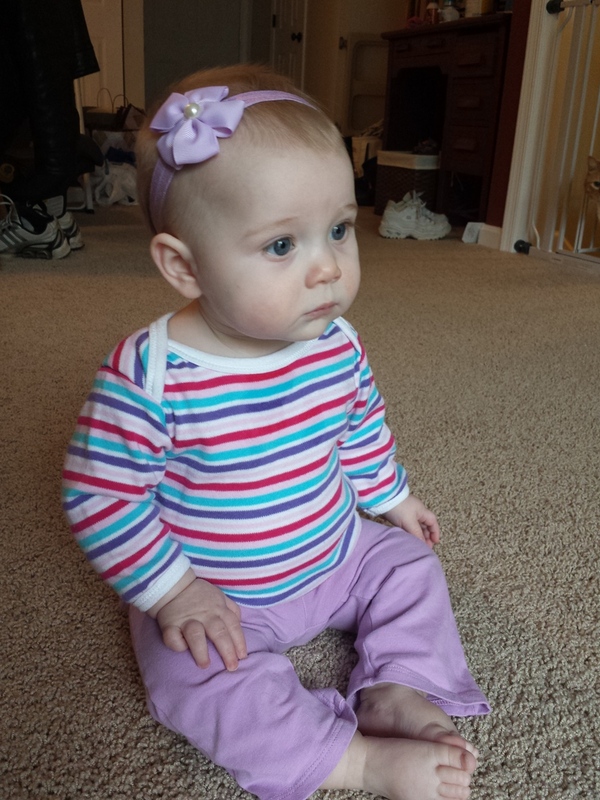 By 7 months, she hadn’t yet learned to crawl, but she was still completely mobile. She could purposefully pivot and roll around the room to get to wherever she wanted to be. 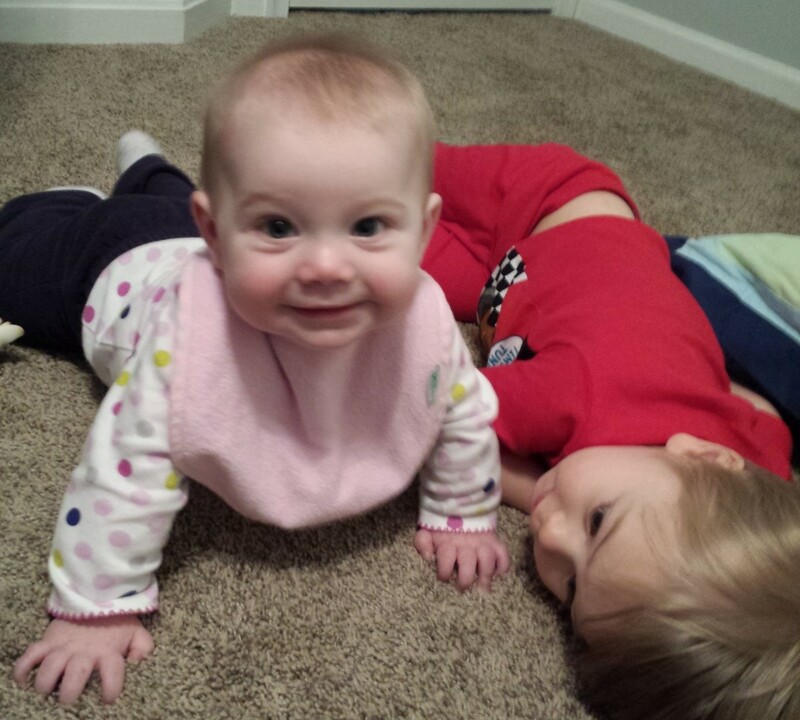 Finally, a week shy of turning 8 months, Leah managed to army crawl. A week later, she was doing a weird combination of army crawling, push ups and the worm thing that Caelan did. She even threw in a stride of normal hands-and-knees crawling. I love watching the evolution of it. She works so hard to figure out how to get where she wants to go. 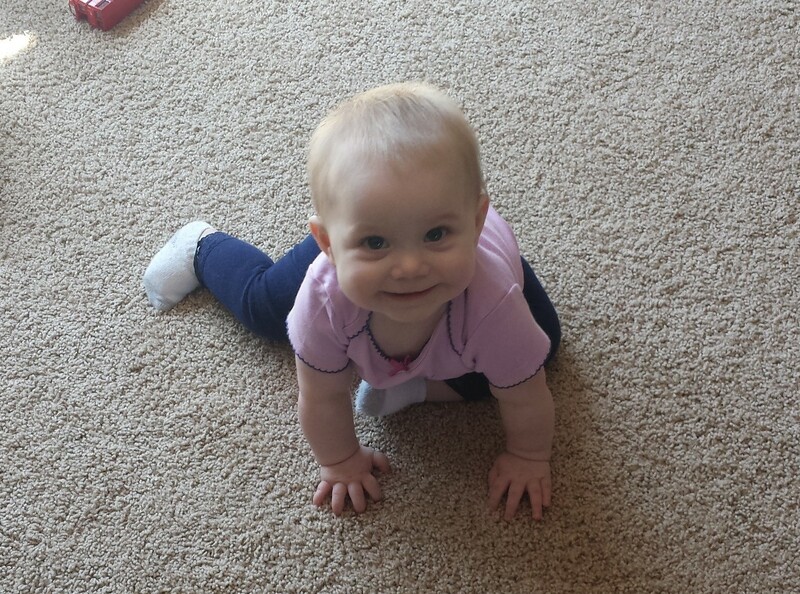 Now, at 9 months, she’s a crawling pro. She can also get from a crawling position to a sitting position and back on her own which has gone a long way in keeping her happy. 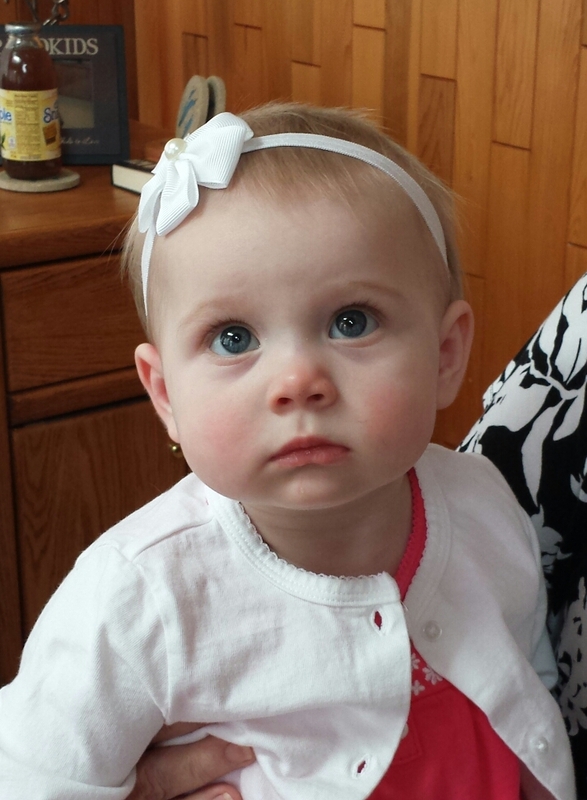 When Leah was about 8 months old, I started thinking “hey, shouldn’t she be babbling by now?” At that point she was still just sticking with the vowel sounds (“ahh ooh ahh”). But, as is often the case, out of the blue one day she just started up with “dadadadadada bababababa” and she was off! She also learned how to clap and she’s working on waving, but at the moment it’s still a little random. She and Caelan have “conversations” which basically consist of yelling nonsense sounds at each other but it is pretty cute. I can’t wait until they can REALLY talk to each other! 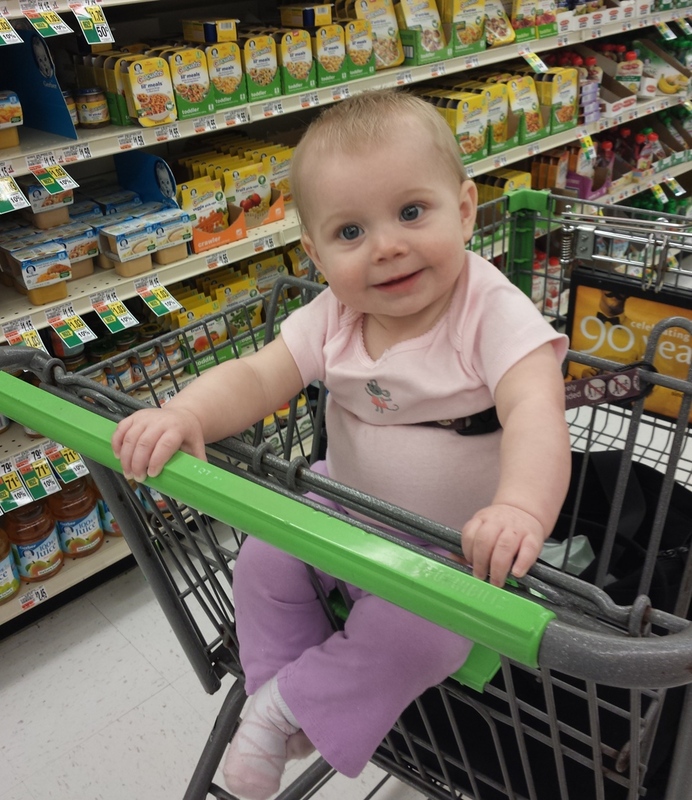 First time sitting in the cart! 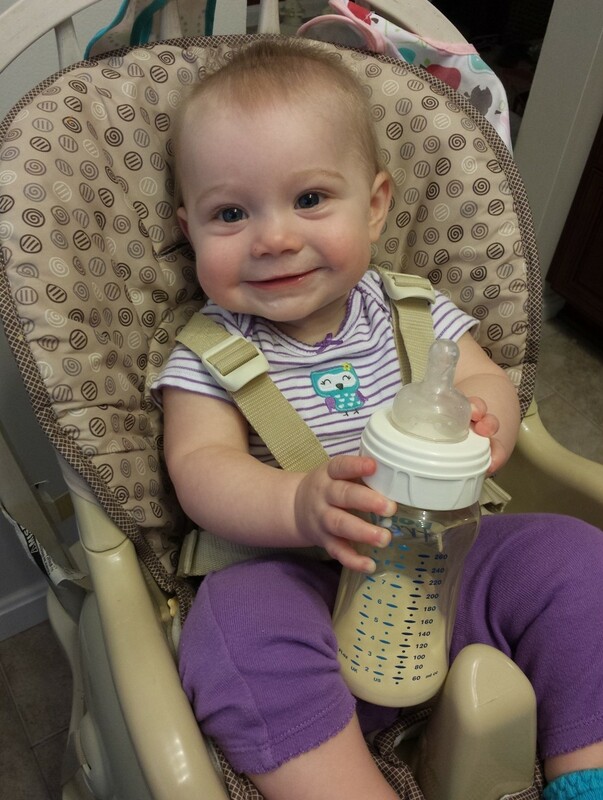 Leah has her cranky moments, of course, but she is the smiliest, happiest baby! People are always commenting on how much she smiles. She LOVES to have her picture taken. Whenever she sees the pre-flash on my phone, she turns and flashes a huge grin! 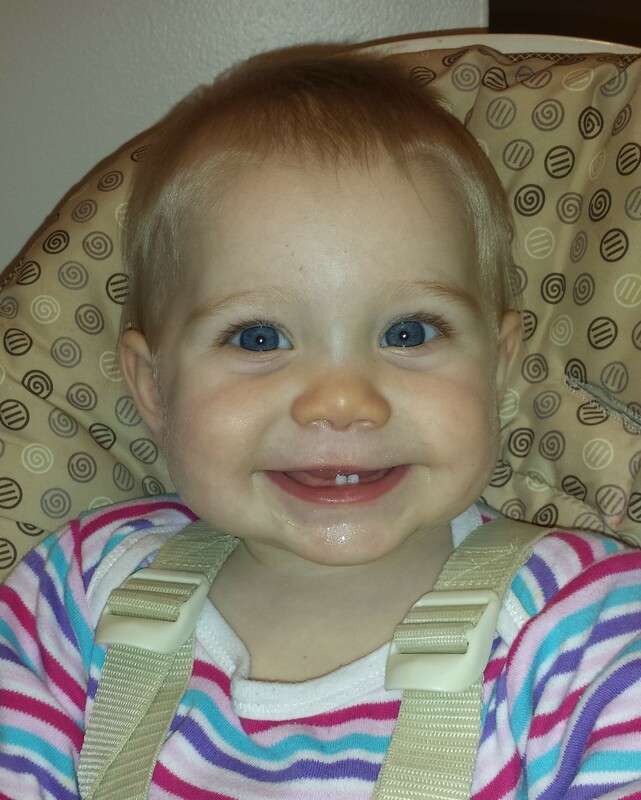 You can kind of see her 2 little teeth in this picture. She still just has the 2. 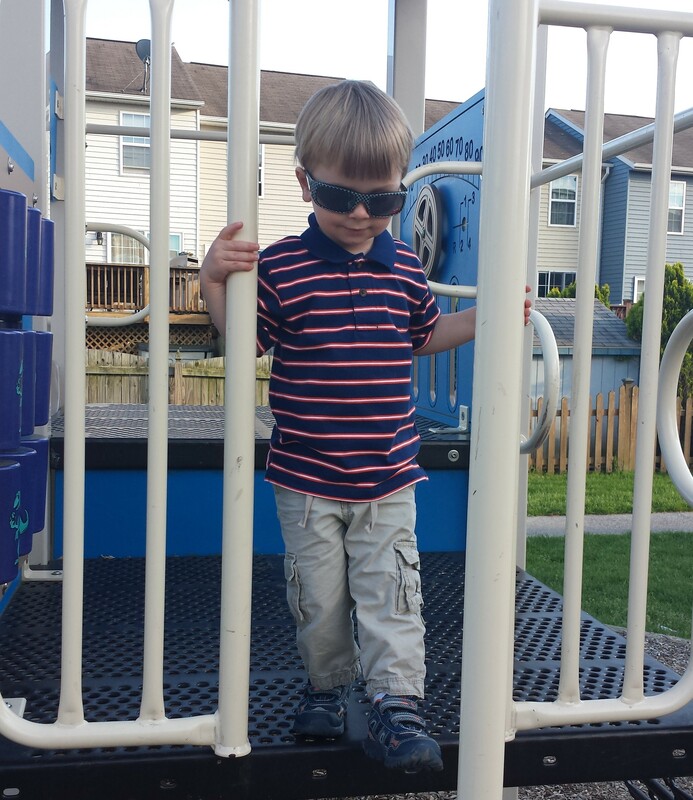 We’re still kind of in “divide and conquer” mode when it comes to parenting both kids. Maybe we just got used to it when Leah was a newborn and we never transitioned out of it. Hopefully in the next few weeks we will start to alternate bedtime routines. I’m also hoping that we can start giving the kids their baths together and we can streamline the whole bedtime process. My favorite picture to date of Leah!! There have definitely been a few times recently when it’s been really overwhelming with the kids. Maybe they’re both screaming at the same time and I just have to close my eyes for a minute to try and tune them out so I can figure out what I was doing. 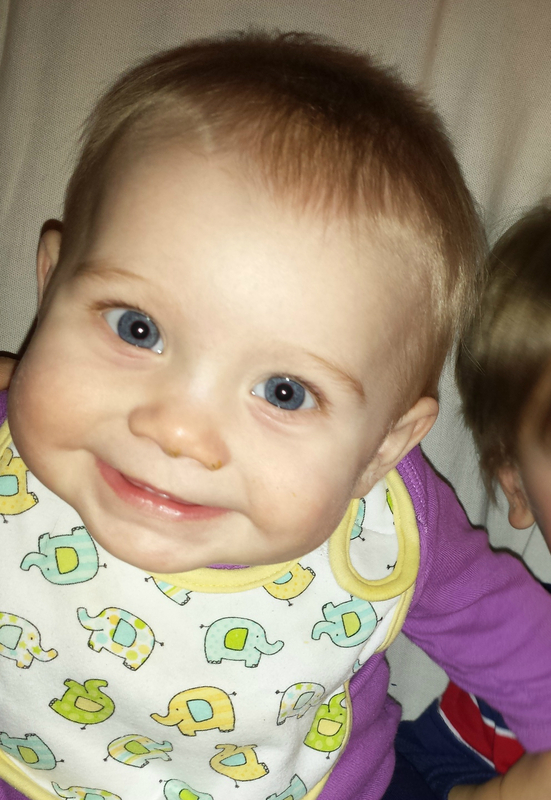 Caelan has been a handful lately and now that Leah is older, she’s into everything. Add to that, one house on the market, one house about to be built, packing, apartment searching, emails, phone calls, and oh yeah, work and kids…It’s been stressful. But the kids keep us laughing we we need it most. And since we moved Leah’s bedtime up, we have our precious 2 hours or so in the evenings when both kids are sleeping. We’re finally into something that resembles a schedule and that makes me happy! 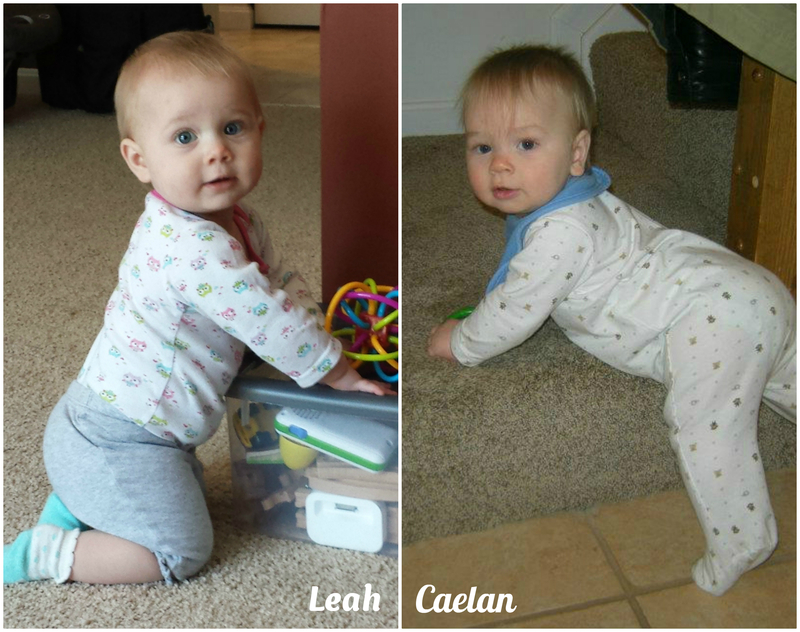 Leah and Caelan at 9 months old! However, I’m sure our schedule will implode in the next few months. It’s going to be crazy. In just 3 short months, my last baby will be a toddler. It’s terribly bittersweet and exciting all at once. Leah’s beautiful personality has come out so much in the past few months and I can’t wait to see more. She laughs spontaneously, she “talks” to Caelan”, she objects if a toy is taken away from her…She’s becoming a REAL girl, lol. But nothing is better than picking her up out of the crib in the mornings and having her snuggle into me – even if she pinches my neck at the same time. You are currently browsing the Decorate This blog archives for May, 2014.